El Salto waterfall, located in the municipality of El Naranjo, San Luis Potosí ,Mexico. 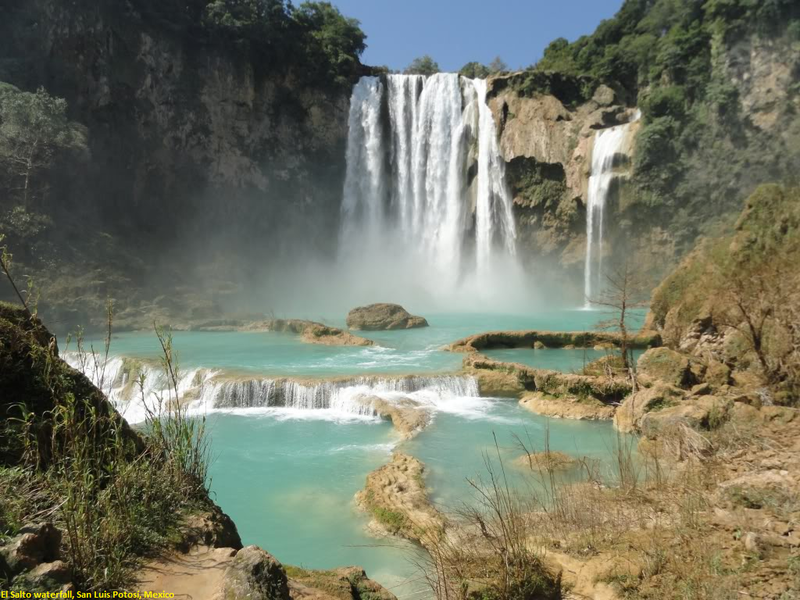 Cascada El Salto is a 70 meters waterfall. And if you dare, there's a spot where you can dive from a 10 meters high rock. A must if you're in this region and in times of rain, it forms deep pools of green-turquoise color, very pleasant to swim. Just above the natural spa a hydroelectric plant is located which, for security reasons, often prevents access to the waterfall. The only dates available to visit it are: during Holy Week and during the rainy season.The noise it provokes, the breeze so intense that it wet you even though you are far away and its beauty are worth visiting. Out of season, that is, when the waterfall does not carry water, the place looks desolate, without any tourists. from Ejido El Meco turn towards CASCADAS EL SALTO-EL MECO road there you find after 6.3 km (10min.) you will find view point of Cascada El Salto.